Volcanion packs a whopping 135 Special Attack stat, and with a base 100 Speed most will barely be able to outspeed this crazy volcano bug. STAB Heat Wave and Bug Buzz can rip through Pokémon that would laugh at this Fire-Bug. Oh wait, I forgot! This Pokémon also carries Quiver Dance, which was increases Special Defense, Speed and Special Attack. In short, become a Special Attacking, Speedy Bug of Destruction. 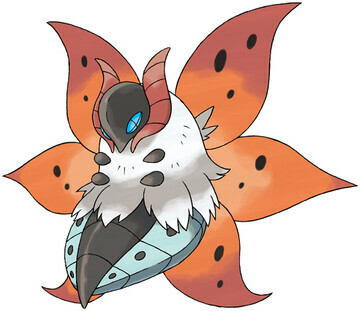 Using a moveset such as Quiver Dance - Heat Wave - Bug Buzz - Sunny Day - Fiery Dance would be good. Choose 4 of the moves and proceed to rip through a team. How come Volcarona has a EV yield of 3 SpA?